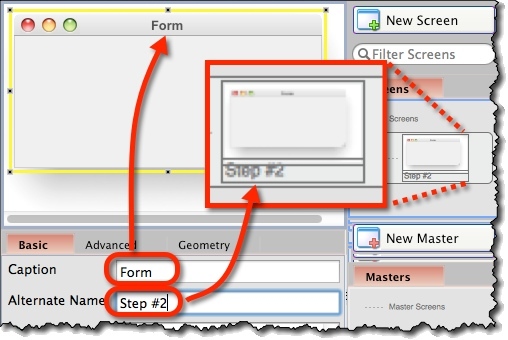 Form is basically a window created for each new screen you create. It can be hidden, so your screen displays only widgets, without a form. Form can be displayed in specific skin, independent of the current overall skin. Default size for new form is 600×400; you can change the default in Options / Editor. Enter menu items preceded with dots (‘.’ character). 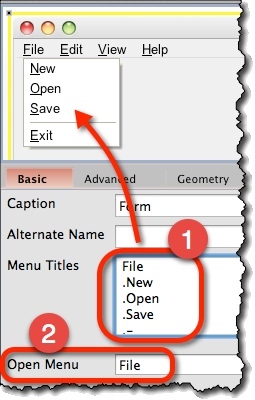 Choose which menu should be displayed as open from “Open Menu” dropdown on the property panel. Separator can be entered with ‘-‘ character. Enable “Don’t show window” checkbox on “Advanced” tab in property panel. Assign an “Alternate Name” on property panel. Form’s titlebar still displays the form’s caption. 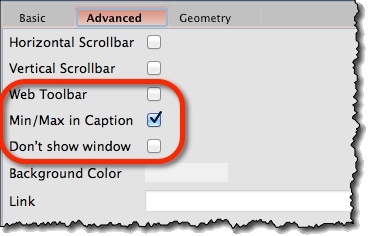 Caption (“Basic” tab) – Text to display in form’s title-bar. Alternate Name (“Basic” tab) – Internal name for the screen. Useful when you have multiple copies of the same screen. 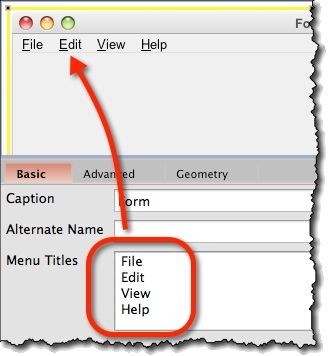 Menu Titles (“Basic” tab) – Items to display in the form’s menu-bar. If there are none, menu-bar is not displayed. Sub-items are preceded with dots. By default, first character is underlined (to underline some other character, prefix it with ‘&’). 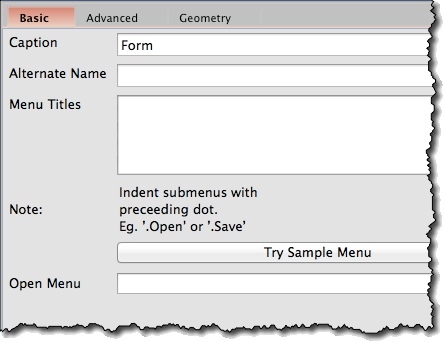 Try Sample Menu (“Basic” tab) – Populates menu titles with easy examples you can tweak. Open Menu (“Basic” tab) – Offers items from “Menu Titles” box. The one you choose here will be displayed as opened, showing its sub-items. Web Toolbar (“Advanced” tab) – Turn web toolbar on or off. Min/Max in Caption (“Advanced” tab) – Whether to show Min and Max icons in the form’s titlebar. 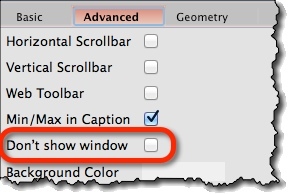 Don’t show window (“Advanced” tab) – Hides the form so that only other widgets are visible. Useful when you need to demonstrate, for example, only a dialog.